Job Wellness, Ergonomic pillows, ergonomic wedges, memory foam pillows for back and neck pain relief. Products for the Support Your Body Needs and the Comfort You Deserve! We Provide Onsite Job Safety & Job Wellness Workshops and Ergonomic Assessments for Your Individual and Corporate Business Needs throughout the Greater Tucson Area. Assisted Living/Adult Care Owners, Managers and Caregivers: Do you need CUEs? We provide Safe Patient Handling Workshops and onsite training with NCIA approved CEUs throughout the year in the Tucson area. View our Job Wellness & Ergonomics Page for more Details. Our Mission: Providing Solutions for Better Health through Ergonomic Products, Assessments and Education. 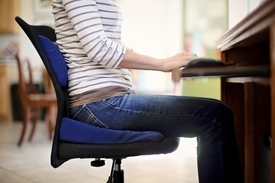 At Spinal Care Products you will find professionally designed and tested products for maximum support and comfort. We offer a variety of memory foam contour pillows, neck and back support pillows, knee and wedge pillows, massage supplies and more. Our products are designed to let your spine rest comfortably in its natural curved position for proper support to the neck and back. Check out our on-line catalogue for the latest in memory foam pillows and other products that help reduce back and neck pain, while adding comfort and support, at home, work or travel.